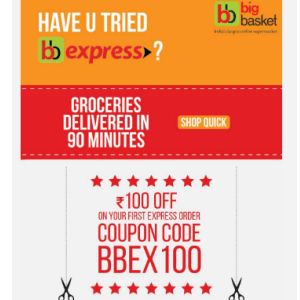 BigBaket Rs 100 OFF on your First Express Order Coupon Code BBEX100 Bigbasket.com is online grocery shopping store of Bangalore, Mumbai, Hyderabad, Pune, Chennai, Delhi-Ncr and Mysore. Now with Bigbasket you can do some quick shopping using code BBEX100 on minimum order value of Rs. 600, and your groceries will be delivered within 90 minutes. Offer is valid for first time express delivery service users. In Express delivery: groceries delivered in 90 min.